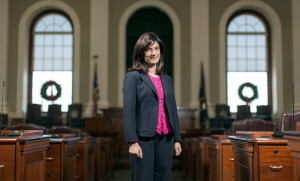 New Speaker of the Maine House Sara Gideon of Freeport says her relationship with Gov. LePage remains one of open communication, candor and mutual respect. She said they return each other's phone calls and meet upon either one's request. New Speaker of the Maine House of Representatives Sara Gideon of Freeport will lead a Legislature that has sometimes struggled to work with combative Republican Gov. Paul LePage. But she says even some of LePage’s staunchest allies have been willing to listen.